The Federation Tug is seen ever so briefly at the start of Deep Space Nine’s sixth season opener A Time to Stand with its tractor beams pulling along the stricken Excelsior Class USS Frederickson. And that’s it. Five seconds. Max. Yet here we are with it as issue 141 ahead of some notably absent friends. I have to say though that Eaglemoss should be applauded for adding in these more unusual craft to give the collection an all-inclusive feel. 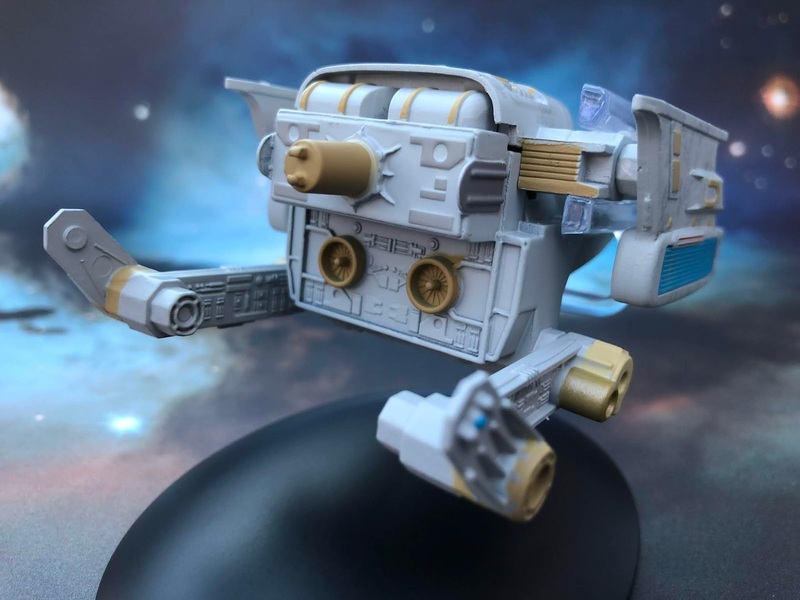 As a model they've done a hugely impressive job of translating the haphazard build of the screen used prop into something more refined for the starship collector. 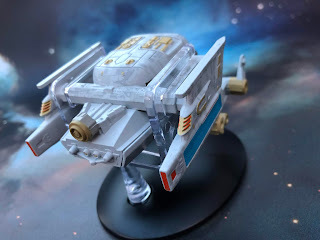 Constructed out of various Star Trek kits and other spare parts, the tug is a compact little beast but one that actually has a ton of stuff to look at and analyse. Bizarrely it sits on its stand backwards with the plastic grip sliding over the front of the ship. Every surface has a story to tell here and even at the forward point you can see elements that have just been placed together to create a visual effect. The base paint coat is a light grey with sections of the hull then mottled with a darker grey overcoat. It looks like we’ve gone for a more heavily worn look than aztecing since its quite uneven. The top plastic section has some good detail even if it is fairly makeshift both on the upper surface and also along the support beam structure running either side of that central unit. Those beams then connect into the two upturned warp pylons "borrowed" from the USS Voyager. These too have the mottled hull effect coupled with some small gold surface detail which links in with the panelling on the upper hull. 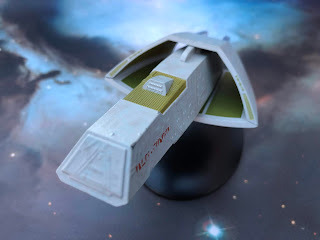 The very recognisable pylons drop into recoloured Romulan Warbird nacelles that are distinctly "Starfleet"ed with blue warp grilles and red tips to the bussard collectors. The inset grilles are fitted with translucent plastic but only to the outer side. 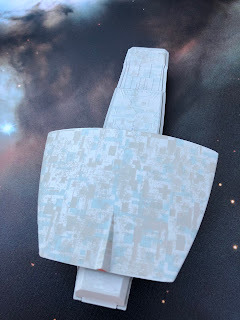 The inner edge of the nacelles are plain and light grey and devoid of any real detail but given the source material it would probably guess that its enough to have the cleaned up outer surfaces. The underside of the Tug right around to that rear section is one metal block. The bottom piece continues the mottled two shades of grey while the back piece contains more of the refined surface detail smoothed in translation from the rough and ready studio model. The effect is rounded out with raised gold fan detail of the holding clamp in the centre and tractor beam points to pick out the key features of this rarely seen craft. Protruding to the rear - and in my case not quite parallel - are the two mechanical arms of the Tug. While their surfaces are just moulded with circuit and panel detail the joint points are again highlighted through the choice to add a bit of gold to the otherwise flat paint surface. Both inside and out are finished with the smaller, angled prongs at the end having more raised surface features but still remaining in just the one light grey colour. The magazine is a little more enlightening than the model, reflecting on references to tugs throughout Star Trek history most notably in The Next Generation before we got one on screen in Deep Space Nine. There's some nice trivia around the ship we see towed in A Time to Stand plus more about the history of these craft and their uses. The views of the tug illuminate the heavy reworking of the screen model especially when you line the two up but only manage - as always - to highlight the main points of the craft and not necessarily any of the more interesting finer details. A double page spread covers off the construction (or what can be recalled) of the tug plus how the series was moving from physical models over to CG at that time. Two pages also get handed to discuss the building of the Ketracel-White facility. The model was a reworking of the prison asteroid from season five's By Inferno's Light and the piece here is fairly interesting to see how a few changes made it look completely different. Finally and perhaps well overdue is the six page article discussing the work of Star Trek's reknowned scenic artist, Doug Drexler. A former makeup artist on the series he made a big leap into creating computer screen cutaways, console panels and adding detail to ships and scenes. It's a decent dive into Drexler's career in Star Trek and certainly one that is about 100 issues late. Perhaps the issue this month that will attract more attention than the tug is the Vulcan T'Pau. 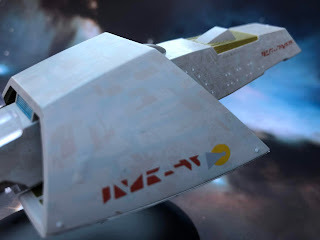 Featured in Unification, the T'Pau was one of three ships stolen by the Romulans as part of their plan to conquer Vulcan. 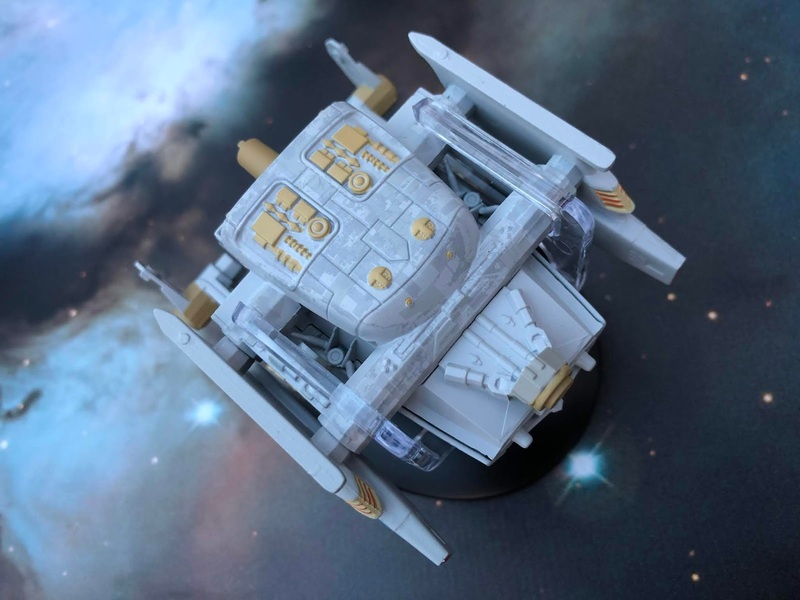 Seen briefly at the end of the second part before being obliterated by a Warbird, the model would live on under a couple of other guises on Deep Space Nine. It's a damn simple design as we've been used to with nearly all the Vulcan ships in the franchise - pen-like centre section with some kind of ring structure surrounding it. Ironically this shape would be retroactively worked into Enterprise most significantly off the back of the Apollo Class we have here. The top and sides of that central section are made out of metal giving this a comforting weight. The sides are finished with some very slight raised detail which is also present on the nose. Now this is supposedly a loading ramp however the panelling is incredibly subtle to the point where I can barely see it at all. Centre top on the hull we have a dotted/grille area which shows up a lot more strongly than the features on the sides and is painted out precisely in a fetching pea green. Now take a closer look at the hull when you do examine this and you'll spot the three shades of paintwork - there's two greys plus a hint of blue in there. Contrasting to the Federation aztecing this is much more blended and haphazard with no clear pattern yet because it is lightly done it's not too in your face. Of course and as you would expect, none of the windows on the sides line up with their respective hull impressions with the white marks sitting just below where they should be. The underside of the hull has a much stronger panel finish with more visible lines and definition under the three-tone paint work. Now inside the warp ring it's difficult to see if there is any continuation of the paint scheme on the main hull yet Eaglemoss have managed to insert grilled pea green panels on the inner edge to add depth to the craft. As they are visible from the front it's a good shout although if they needed to be grille-finished is anyone's guess due to their tight placement. At the edges of the "ring" (more oblong/oval really) there are the warp grilles painted up and slightly raised for detail purposes. Quite a slender and accurate paint job to mark these in and there's no spill out into the rest of the paintwork. 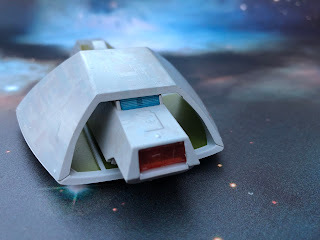 To the rear and seemingly suffering from a little less detail than everything to the front of the warp drive, there are two translucent panels. The lower is the impulse engine which means the upper blue one has to be for the warp engines. They are very basic with some of the exhaust structure on the impulse drive not totally visible although both are well recessed into the hull. Looking at the underside of the warp ring we have a big open and curved surface to show off this more unusual paint finish with what must be a red running light sitting up at the very edge. Finally the T'Pau is finished off with a series of Vulcan scripts either side of the central hull and a third on the starboard sweep of the warp ring. This is screen accurate and even better since Eaglemoss have included the IDIC medal on that final decal. It is simple in every sense of the word when it comes to design and construction and Eaglemoss have worked well to build a very stable warp ring around the hull here. Some of the join lines aren't the best we've experienced but the finished item is a streamlined visual experience that carries off the essence of the ship. The magazine does show that the central hull markings should be a lot more defined but seeing as we never really got to see this one that up close it's a difficult call. 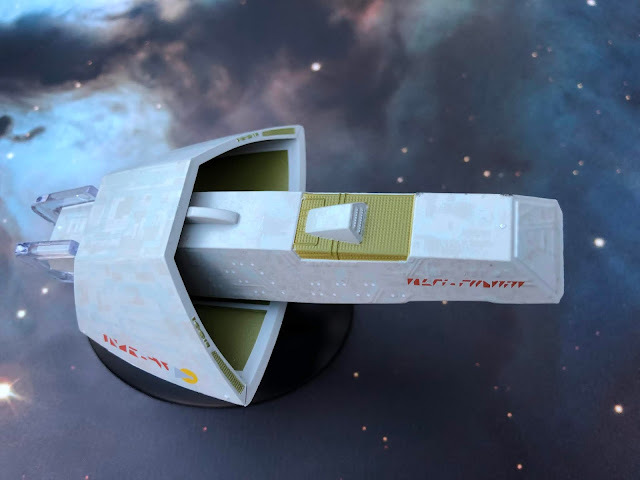 Issue 141's new CG imagery highlights that amazing hull three-tone scheme as well as the previously mentioned increased definition on those hull elements especially at the nose. The standard brief history of the craft covers six pages which also feature shots from Unification to flesh out the backstory for this starship. Take a good look at the shot top right on page seven which features a few recognisable craft as well as some oddments! Plan view notes are even more scarce than on the equally screen shy Federation Tug but that's what you will probably expect from something we've barely seen in motion. The design process for the T'Pau raises its starting point back with the only other Vulcan ship we'd seen at the time which was the long range shuttle from The Motion Picture and explains the evolution from there. Evolve it certainly did and ended up looking nothing like the original marker but would influence more Vulcan ships in the future. 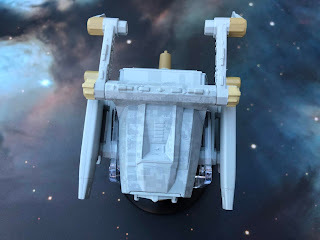 This section also covers a couple of other appearances the model made as Tosk's ship in Deep Space Nine's Captive Pursuit and also as a freighter in For the Cause also from the same series. Remaining firmly with The Next Generation in this instance we are treated to Production Design from the fifth season covering how the art department created refugee villages for the Bajorans in Ensign Ro as well as suburbs for Romulus in Unification, mud baths for Cost of Living and utilised existing buildings for the 19th Century in Time's Arrow. This is a captivating read giving away a few trade secrets on how the illusion of alien worlds or time gone was executed. This month's two craft might only have been seen for a total of 20 seconds on the screen at maximum but Eaglemoss have really worked to make them presentable for collectors most definitely in the case of the rather rough and ready Federation Tug. 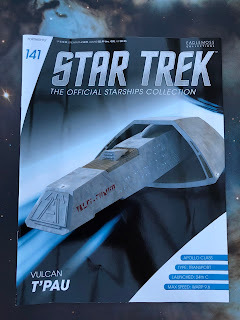 Neither of these are big ticks off my list of essentials however that might be changing when the next issue finally arrives because it's the Promellian Battlecruiser from The Next Generation's Booby Trap accompanied by the Merchantman from The Search for Spock. Now those are two I can't wait to get my hands on! Liking this month's two alien additions? Which one was the stronger executed replica?